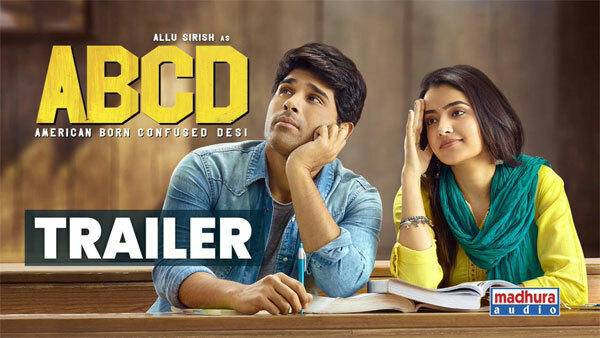 Mega hero Allu Sirish’s next outing ABCD: American-Born Confused Desi, official remake of Malayalam super hit film of same title, deals with the journey of two young American Telugus to India. Ace director Trivikram Srinivas who will next be directing Allu Arjun has launched theatrical trailer of ABCD just a while ago. ABCD trailer begins with introduction of our protagonist Allu Sirish who follows 3 E’s (Enjoyment, Entertainment And Excitement) in life. The trailer actually unfolds the plot of the film. It is all about awful experiences of two rich NRI guys during their stay in India. Stuck in political scuffle here, Sirish even go to jail. Sirish impresses with his innocent acts. Bharath seen as Sirish’s best friend seems to have taken the responsibility to provide comic relief, wherein Rukshar Dhillon as Sirish’s friend looks pretty. Cinematography is neat and background score is enthralling. Sanjeev Reddy makes an impressive debut as director. All in all, ABCD trailer provides enjoyment, entertainment and excitement to the viewers. They announced to release the film on May 17th. Madhura Sridhar Reddy along with Yash Rangineni is bankrolling this project under Madhura Entertainments and BigBen Cinema Banner.